Delhi promised to deliver world class Games and Delhi delivered, there was nothing better to showcase the success of the XIX Commonwealth Games than a grand Closing Ceremony. 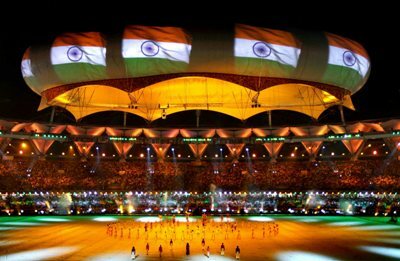 A dazzling laser show and a musical extravaganza marked the finale of the Games, the biggest sporting event hosted by India which crowned itself with sporting glory by winning an unprecedented 101 medals. Skies over the national capital Delhi lit with multi-colour laser beams and fireworks as part of 160-minute closing ceremony at the Jawarharlal Nehru stadium filled to the capacity of 60,000 cheering sports lovers including Vice-President Mohammad Hamid Ansari, Prime Minister Manmohan Singh, Congress President Sonia Gandhi as well as other VIPs. The Ceremony reminded that some 7000 athletes from 71 countries had sportingly competed for 826 medals of which India won 101, including 38 gold, its highest ever, to be the second in the tally behind Australia with a total of 177. Prince Edward, vice-patron of the Commonwealth Games Federation, formally declared the XIX edition closed amid thunderous cheers from the audience. chairperson, CGF chief Michael Fennell and Sri Lankan President Mahinda Rajapaksa, the guest of honour. The Indian national anthem was played as the packed stand stood up in respect to mark the beginning of the Closing Ceremony. Pyros took off from the roof of the stadium giving a delightful sight as countdown in the Devanagri script opened up the proceedings with the crowd roaring from the stands. There was much excitement and euphoria in store when a tribute was paid to the India's sporting spirit, aptly titled Agni -- a segment that featured the fiery and passionate tradition of the country's martial arts. Chants of Agni shloka preceded eight martial art forms -- Kalaripayattu, Naga warriors, Thangta, Gatka, Silambam, Akhara, Dhan Patta, Talwar Raas -- that enthralled the audience as skies lit up with dazzling fireworks. Fourteen military bands, 17 pipes and drums of various regiments and battalions of the Indian Army performed in unison as pigeons were set free. Dressed in white, 2010 Delhi school children paid tribute to the motherland performing to the tunes of Vande Mataram as they took positions to form rangoli pattern and Ashoka chakra on the field. The performers sprinkled the tri-colour of Indian flags, signifying the festival of Holi in what turned out to be a visual delight. In a surprise package, the Games volunteers, Delhi United, chugged into the stadium making a beeline in a display of Indian Railway’s legacy. Flags of the 71 participating nations with ace shooter Gagan Narang holding the Indian Tricolour entered the field together as one big contingent, signifying the bonds and friendships formed during the Games. The official mascot of the Games, Shera, was given an emotional farewell as he went around the stadium accompanied by singer Shaan. OC CWG Delhi 2010 chairman Suresh Mr. Kalmadi in his speech said the Games had given a new beginning to Indian sports. "The sporting extravaganza has ended," he said. "But it's not the end, it's just the beginning. For India, it's a new beginning in sports," he said. The ceremonial Flag handover segment began with Delhi Chief Minister Mrs. Sheila Dikshit saying, "In a few moments, the ceremonial Flag will be entrusted to your care so that in due time you deliver it to Glasgow." Official representative of the 2014 host city, Robert Winter, who is the Lord Provost of Glasgow, said, "This duty I willingly undertake to fulfil," as the Games flag was lowered with an Army band in the background. The otherwise vociferous spectators were stunned in silence in an emotional moment of sorts as they bade farewell to the Games. Mr. Kalmadi received the flag before handing it over to Delhi Lieutenant Governor Tejinder Khanna who in turn gave it to Mr. Winter. Scottish performers soon took the centre-stage proudly showcasing their country's spirit, culture and heritage in a 10-minute Glasgow segment. The performers began with a lone piper as the spotlight soon shifted to a giant structure that inflated and the Clyde Arc Bridge with the Armadillo and River Clyde flowing underneath was created, leaving all mesmerised. In all-praise of Delhi, the CGF president also said, "Delhi you have delivered a truly exceptional Games. Thank you Delhi," as the 12-day sporting spectacle was declared closed by Prince Edward. Soon a seven-minute laser show accompanied by heart-thumping music was the order of the day. A 30-minute segment titled 'Music of Universal Love' featuring renowned Indian singers and musicians mesmerised the crowd in the final leg of the ceremony. It began with DJs performing with 1000 dancers on five stages of the field in an electrifying atmosphere with a 25 stacks of speakers blaring 500,000 Watts of sound. Musicians Taufique Qureshi, dhol players Kamal Sabri, Niladri Kumar, Bikram Ghosh, Sivamani and Raghav Sachar performed in the event. There was also further entertainment from singers Kailash Kher, Zila Khan, Sukhwinder, Ila Arun, Usha Uthup, Shiamak Davar, Shankar Mahadevan, Shubha Mudgal, Sunidhi Chauhan and Sreeram who belted out some Indian chartbusters.